A State Machine Behaviour is a special class of script. In a similar way to attaching regular Unity scripts (MonoBehaviours) to individual GameObjects, you can attach a StateMachineBehaviour script to an individual state within a state machine. This allows you to write code that will execute when the state machine enters, exits or remains within a particular state. This means you do not have to write your own logic to test for and detect changes in state. 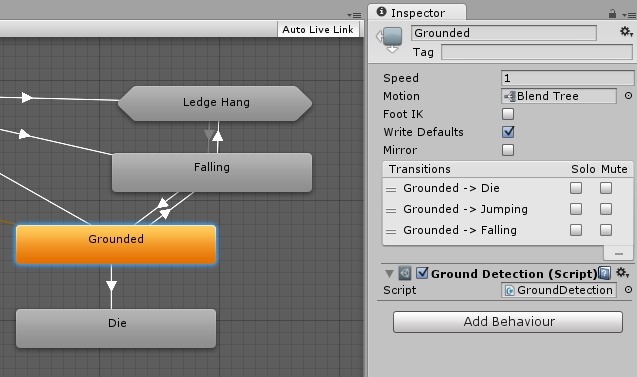 State Machine Behaviours can be created and added to states in a very similar way to the way you would create and add scripts to GameObjects. Select a state in your state machine, and then in the inspector use the “Add Behaviour” button to select an existing StateMachineBehaviour or create a new one. State Machine Behaviour scripts have access to a number of events that are called when the Animator enters, updates and exits different states (or sub-state machines). There are also events which allow you to handle the Root motion and Inverse Kinematics calls. For more information see the State Machine Behaviour script reference.